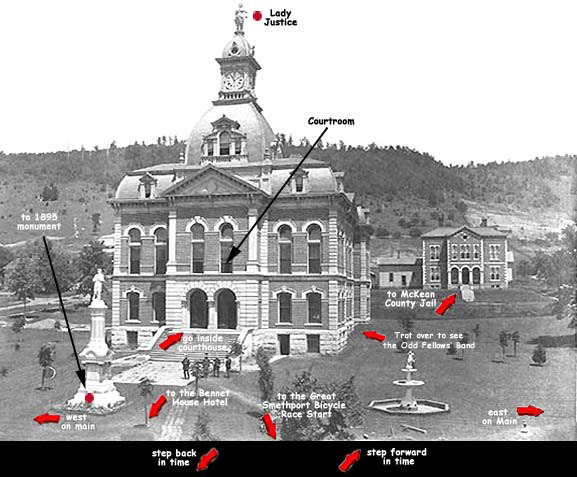 Above is a picture of the third courthouse after it was severly damaged in a fire. This fire occured on February 12, 1940. Smethport - lady justice had held her sword for 59 years, weathering wind, storm and snow, but on a bleak day in February 1940, she was felled by fire. 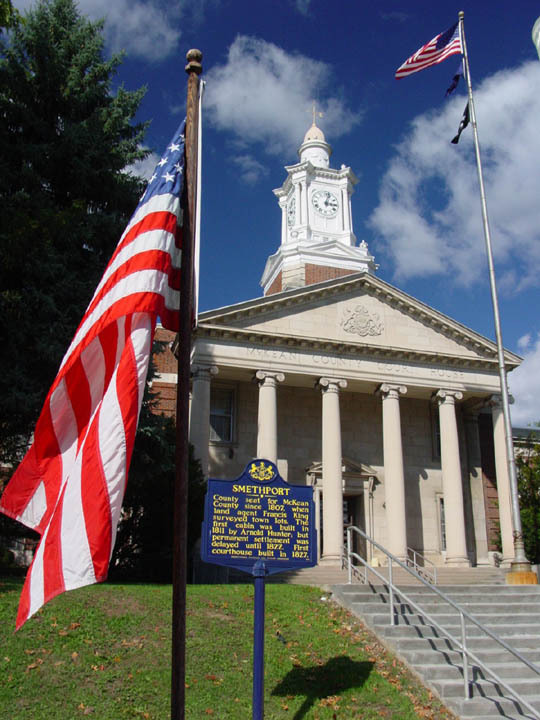 Although the vision of justice that once capped the McKean County Courthouse was lost, her weapon was saved through the effors of one Smethport fireman. It was on snowy Monday morning. Feb. 12, 1940, when George Brown and his buddy, Tom Pomeroy, heardthe first blast of the siren. The county's seat of goverment was on fire and already in death throes. Not long after the first alarms were sounded, fire companies from Kane, Mount Jewett, Eldred and Port Allegany arrived on the scene. Flames leaping 130 feet into the frigid sky had already engulfed the central tower of the building. which held the clock and above it, the statue of justice holding the sword in her left hand and scales in her right. By the time most of the fire equipment was in place, the center tower collapsed and plunged inward and down onto the main floor, taking with it the clock, the tower and the statue that had looked out over Smethport for 59 years. It wasn't until the remains of the courthouse were smouldering ruins that investigators determined the blaze had originated in the bailing room in the basement below the prothonatary's office. Once established, the fire spread quickly through ventilators ducts to the central tower, which acted like a funnel. After the infoerno had destroyed the tower and the central structure had collapsed inward, ruins and ashes covered that whole courthouse aquare. A day later trucks and wagons appeeared to begin the tax of removing debris to a nearby dumping center. Poking through the rubber, Brown spotted and retrieved the twisted, bent sword that fell when Lady Justice tumbled from her pedestal. 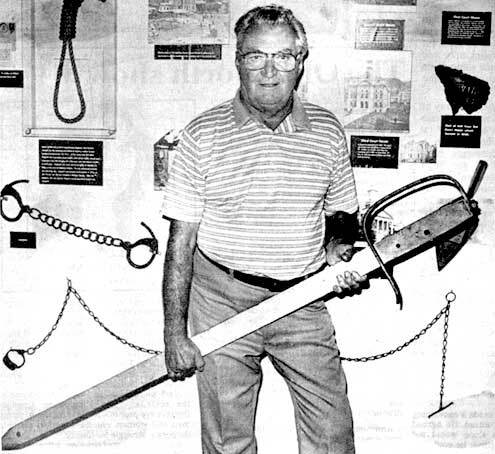 The five-foot weapon was one of the few relics from the courthouse that didn't end up in the refuse heap. After saving the sword from its intended fate, Brown and his fellow firemen straightened tghe blade, repainted it, and placed in on a wall in the old firehall located on the corner of Water and Fulton streets. The sword remainded in this biulding until a new fire structure of concrete blocks was built on the corner at Nelson and Water streets. Once again, the sword came to risk. During the move to the new station, the blade was relegated to a truck, whose destination was the county dump. Once again, Brown and friends rescued the sword returned to the courthouse, a donation to the Mckean County Historical Society Museum. Visitors to the museum can view the sword and the only other piece of courthouse memorabilia to survive the conflagration , a piece of the bell that was part of the original courthouse. 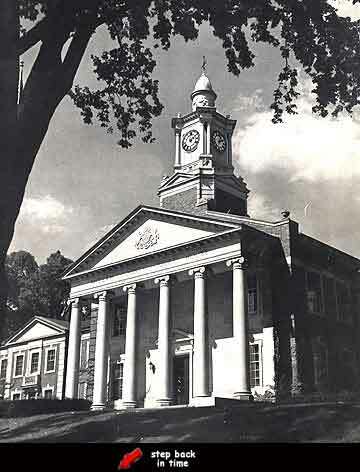 The first Mckean County Courthouse was built in 1827 at a cost of $3,000. the building was described as a "very substancial two-story brick and stone structure." The jail, the debtor's room and the sheriff's residence were on the first floor. Church services were frecuently held in the courtroom on the second floor between 1827 and 1833. Water was supplied by a spring on Brennan's Hill South of town, through a pipe made of hollow logs. 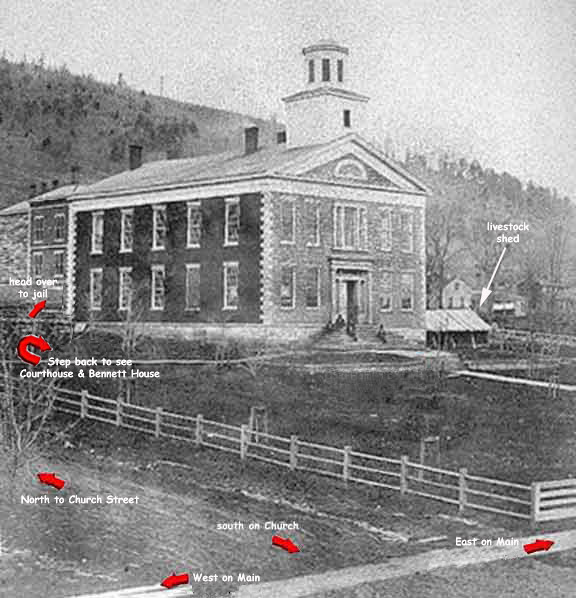 In 1879 the first courthouse was declared inadequate and unsuitable for further use and in September of 1879 the Methodist Church was rented for temporary use as a courtroom. 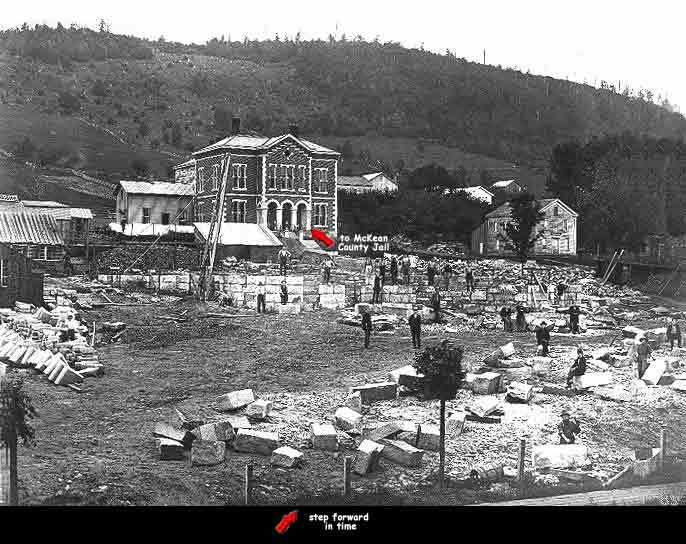 By september of 1881 the new, enlarged courthouse was completed and dedication ceremonies were performed by E.R. Mayor, Lucius Roger and John R. Chadwick. 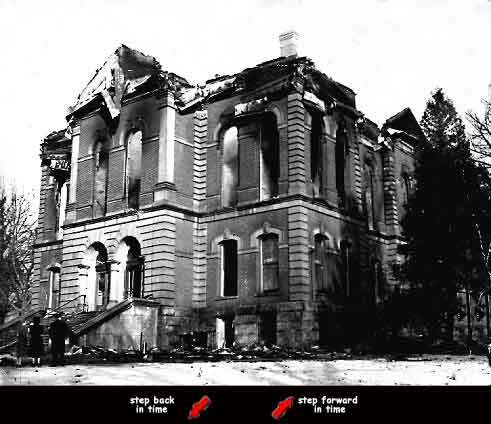 It was this courthouse of 1881, built at a cost of $110,000, which burned in the early morning fire of February 1940.